Jim Wagner Reality-Based Personal Protection will not only teach you the most up-to-date police, military, security, bodyguard, martial arts, and counterterrorism techniques and training methods accepted globally to deal with modern conflict situations, but Jim Wagner also teaches what no other civilian systems are teaching: Pre-Conflict and Post-Conflict training - what to do before a conflict and after one, in addition to Conflict training. Learning life protecting techniques are easy. You can learn directly from Jim Wagner through courses and seminars offered worldwide, or you can learn through our DVDs, books, and other Reality-Based Personal Protection educational materials – all found on our online store. So, how do you know what is right for you? Traditional-based systems, such as Karate, Tae Kwon Do, Kung-fu, and others, are ancient systems that adhere to ancient techniques and training methods. They typically wear uniforms, have a belt ranking system, and require their students to learn foreign customs, traditions and terminology. Found within these systems are fundamental self-defense principals, but they are not structured to teach students modern criminal and terrorism situations such as bombings, armed robberies, drive-by shootings, carjackings, gang violence, threat assessment, etc. Sport-based systems, such as Ju-Jitsu, Judo, Greco-Roman Wrestling, Western boxing, and others, have their roots in traditional-based martial arts, but adhere to sporting rules in order to compete in various tournaments, sporting events, or even the Olympics. Like the traditional-base martial arts, viable self-defense techniques and training methods can be gleaned from sport-based systems as well, but also like the traditional-based systems they also lack many modern conflict solutions. Reality-based systems are those systems that teach the fundamental self-defense techniques that are found in both the traditional-based and sport-based systems, but go a step further by training specifically for modern conflict situations, and eliminating outdated techniques and training methods. Although there are many systems today calling themselves “reality-based,” because they see themselves as training more realistically and have abandoned nonessential customs and traditions, few of them are actually “complete reality-based” systems. In other words, they lack Pre-Conflict and Post-Conflict training in their curriculums and their Conflict training may be lacking simply because they have no real-world experience with criminals, abnormals, or terrorism. Jim Wagner was not only the first instructor to articulate that there are these three distinct branches in the martial arts, but he was the first instructor to tie Pre-Conflict, Conflict, and Post-Conflict training together into one system. Just pick up any martial arts magazine dated 1998 or earlier, and you will find virtually no police, military, criminal, terrorism, or reality-based articles within those pages. 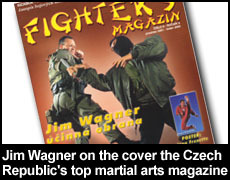 Through his writings, starting with Black Belt magazine (USA) and Budo magazine (Europe), Jim Wagner opened up the flood gates, and now you see a movement towards more realistic self-defense training and a whole new classification of advertisers in every martial arts magazine globally. What exactly is the Reality-Based Personal Protection system? Jim Wagner left full-time law enforcement and formed the civilian version of his system. Thus, on January 21, 2003 this revolutionary system was officially born. Training and survival skills based on modern conflict situations that the practitioner is likely to encounter in their environment (their “reality”), in an accordance with the use-of-force continuum of that jurisdiction. The Jim Wagner Reality-Based Personal Protection system is the world’s original reality-based system, not just because Jim Wagner coined the term for the civilian martial arts, but because it is the very first system to include Pre-Conflict, Conflict, Post-Conflict and the creation of the very first civilian use-of-force continuum graph. Pre-Conflict training is the foundation for all of our courses which includes, Threat Assessment, Situational Awareness, Conflict Cues (reading a person for hostilities), the O.O.D.A. process, legal issues, criminal counter-surveillance, knowing the Assault Elements, Threat Zone Management, Conflict Conditioning (mentally and physically, training documentation, and much more. Post-Conflict training are those actions immediately following a physical conflict, such as Self-Triage and Combat First Aid, victim rescues, citizen’s arrest methods, Incident Recollection, evidence identification and preservation, police contact, the Conflict Cycle, courtroom survival, and the list goes on. Conflict training is where we go way beyond what any other self-defense system teaches. Our techniques come from the world’s elite police, military, corrections, and security units, which ultimately ties into an understanding of criminal and terrorist tactics. We’ll teach you what few instructors are qualified to teach: defense against terrorist bombings and small arms attacks, criminal style stabbings, carjackings, drive-by shootings, kidnappings, sexual assault, armed robbery, criminal chemical attacks, gang violence, school and workplace massacres, child abductions, sniper attacks – just to name a few. Of course you’ll learn all the strikes, blocks, and movements common to other systems, but only those techniques that will actually work in the streets or the battlefield. That’s right – battlefield. Although this is a civilian personal protection system, police and military personnel often attend these courses simply because much of what we teach is not even taught in many units and agencies, or in such a comprehensive manner.